3) Use newest Aluminium and Zinc Alloy material and carbon fiber cover. 4) Strong magnetic battery door, convenient and beautiful. 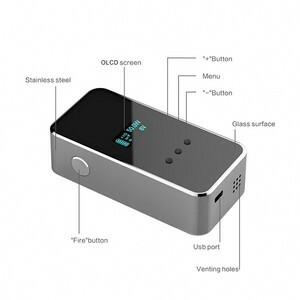 5) Big color LCD display screen, can show date, time and your vaping data . 2. Short circuit protection: if short circuit, the red indicator would flash 6 times and stop working automatically. 3. Low load protection function: loading less than 1.2ohm, the red indicator would flash 6 times and stop working. 2. 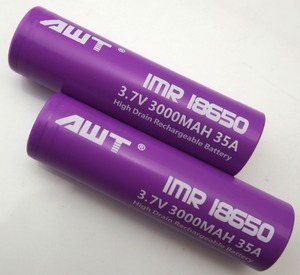 If no using for more than 2 monthes, please take out the 18650 battery to put it alone. Compan profile: Elego is the biggest franchised agent for great E-cigarettes in China. 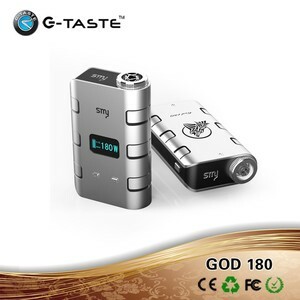 Warranty provided: 6 months for battery, 1 months for atomizer from the shipping date. If any defect, free replacement will be sent along with your next order. 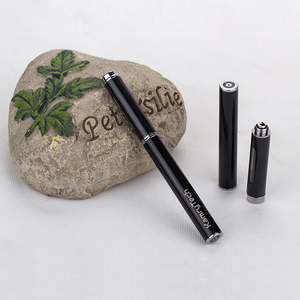 Comes in stainless steel the size is 120mm long, 23.6mm wide, and support batteries up to 81mm in length. &middot; Our scale--We are a manufacturer with strong developing ability and high innovating. After confirming all the detailed information, PI (Proforma Invoice) will be made for you to check and confirm. 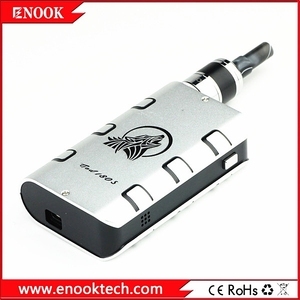 Smy adjustable voltage k100 mod ecig ic protection chip/kick The Greatest advantages of K100 E Cigarette: 1. No Welding to the battery could make its life last longer and safer; 2. No Circuit board in the battery; 3. 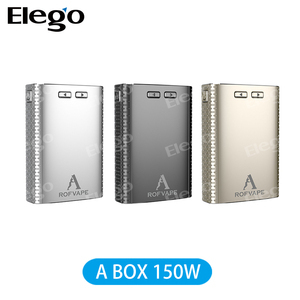 Battery compartment could be scalable to match with different battery length, could match with 900mAh/1300mAh/300mAh capacity, and the battery have 18350/18500/18650 model, and all atomizers can be compatible, and the atomizer could be detachable, atomization core could be replaced; 4. Golden yellow,blue and champagne Colors are available at present, and they look like so beautiful and unique; 5. Unique design could let you enjoy a comfortable hand feel and also taste so good. K100 E Cigarette Technology Specification: Packing Way EGO Case(L) Atomizer Diameter 22mm&plusmn;0.5 Atomizer Length 73mm&plusmn;1 Atomizer weight 37g&plusmn;1 Battery Cone Diameter 22mm&plusmn;0.5 Battery Cone weight 88g&plusmn;1 18350 Battery Cone Length 74mm&plusmn;1(18350&times;1pcs) 18350 dry battery weight 23g&plusmn;1 18500 Battery Cone Length 86mm&plusmn;1(18500&times;1pcs) 18500 dry battery weight 32g&plusmn;1 18650 Battery Cone Length 101mm&plusmn;1(18650&times;1pcs) 18650 dry battery weight 40g&plusmn;1 2&times;18350 Battery Cone Length 108mm&plusmn;1(18350&times;2pcs) / / Battery Cone Length 87.5mm&plusmn;1(no dry cell) Battery Cone weight 88g&plusmn;1 one e-cigs size(Battery+X6 atomizer) 154mm&plusmn;1 one e-cigs weight(Battery+X6 atomizer) 125&plusmn;1 Input voltage 3.7V Output voltage 3.7V~4.2V K100 Starter Kit Packing Component as Follows: 18650/18350 Battery Battery Tube Atomizer Cover K100 Atomizers Battery Charger Manuel Warranty Card Ego Zipper Case 2pcs 1pcs 1pcs 2pcs 1pcs 1pcs 1pcs 1pcs Packaging & Shipping Delivery time: 1-3days for sample order, 3-10days for official order(within 2000sets) Packaging Detail: carton box , package or OEM service package Delivery Detail: 3-7 days How To Order 9 ( Any question, please contact at Skype: smy-005 ) Please let us know the specific model, color, battery capacity, quantity, etc that you need through email or Live Chat. After confirming all the detailed information, PI (Proforma Invoice) will be made for you to check and confirm. Send by Air: Arrive at destination Airport fast then need you to pick it up C. Ship by Sea: Low shipping cost and slow delivery ( 25 -30 days depends). Suitable for large quantity and non-urgent delivery. 3. Advanced production equipment, many core machine import from Germany. 7. Fast delivery, and good quality control team to ensure timely delivery. Custom packaging service No matter the inner packing or the outer carton. 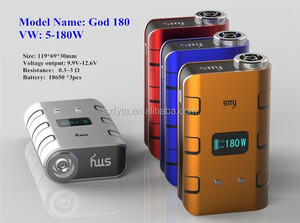 Alibaba.com offers 38 smy mod ecig products. About 15% of these are other healthcare supply. 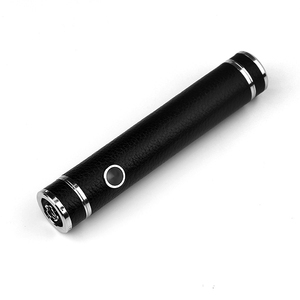 There are 38 smy mod ecig suppliers, mainly located in Asia. The top supplying country is China (Mainland), which supply 100% of smy mod ecig respectively. 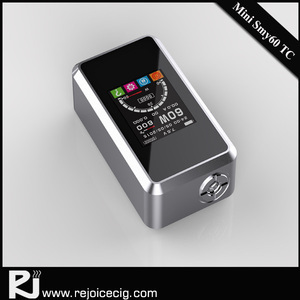 Smy mod ecig products are most popular in North America, Western Europe, and Northern Europe.